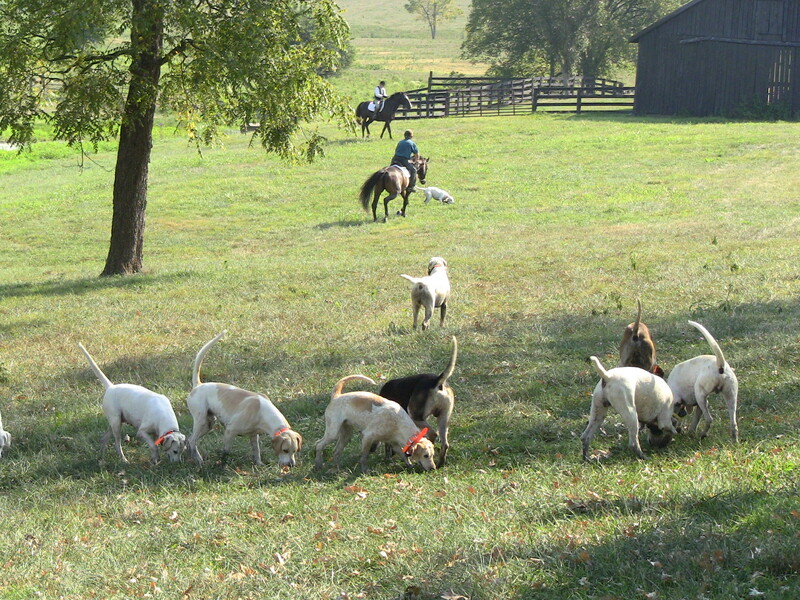 Huntsman Lilla Mason and the hounds at Boone Valley. WE saw our first hedge apple of the season this morning on the way to the barn–surely they’re showing up prematurely this year? Possibly. 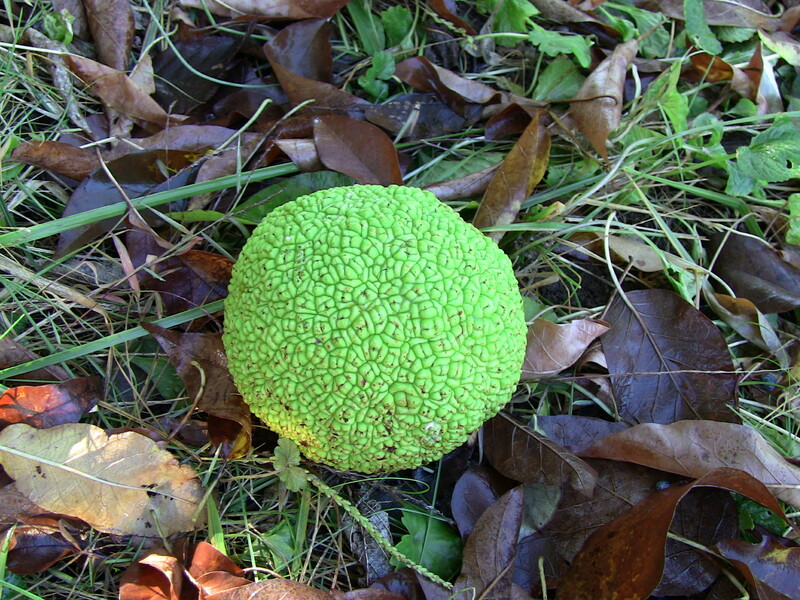 It seems early for hedge apples (or horse apples or Osage oranges, if you prefer), but it’s certainly very late for a hound blog update. Central Kentucky was in the grip of drought for most of mid-summer, but, thankfully, now that drought and the hound blog post drought both have ended! .. and quite a lot of this! As the hedge apples are telling us, now we’re on the brink of fall, and that means the hounds’ summer walks are gaining a sense of urgency as hunt season approaches. 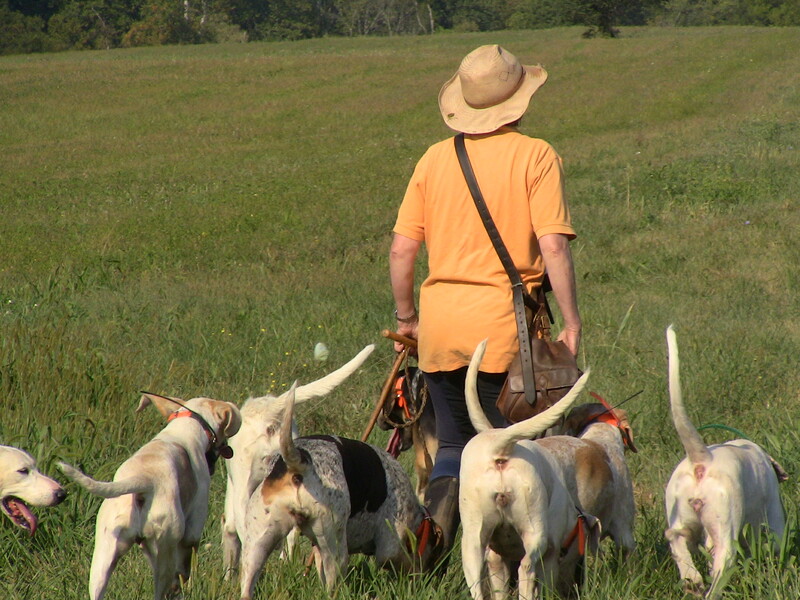 Iroquois huntsman Lilla Mason has been walking on foot with the hounds, rather than on horseback, and her focus has been on keeping the hounds’ attention and reinforcing the all-important connection between huntsman and hounds. That reinforcement is always part of summer walk, but it’s developed a little more urgency this year as Lilla prepares the working pack–and some of its more potentially willful hounds, in particular–for the arrival of the young lions, the HA litter, who will join the working pack this fall for the first time. 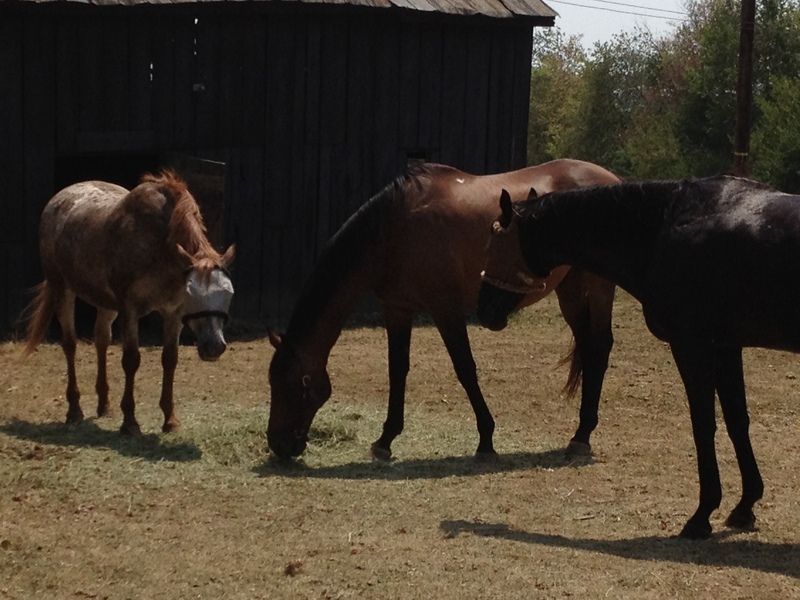 Hounds and horses enjoy a shady respite during their walk. The HAs, meanwhile, have been a piece of cake. 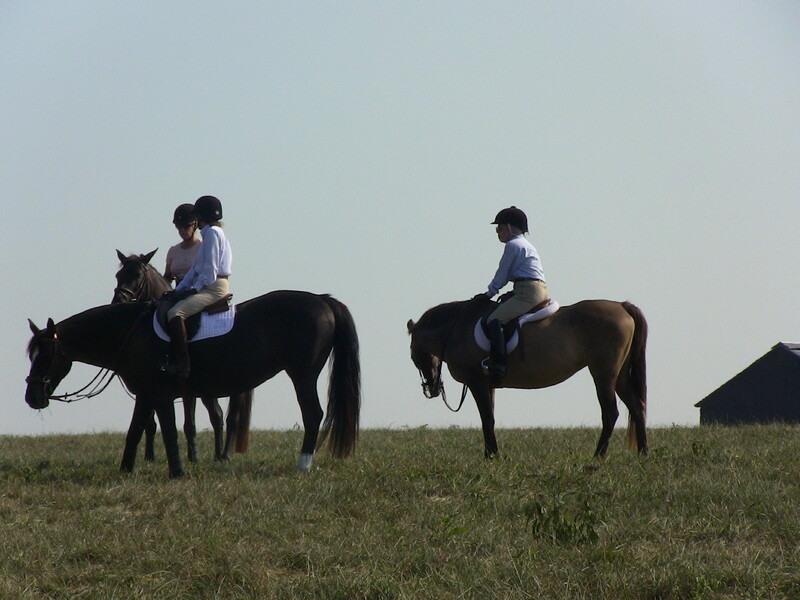 They spent much of the spring training for the Virginia Hound Show, which paid off handsomely. “They’ve gotten everything down,” Lilla said. “Here’s the problem we’re addressing now as we approach hunt season. 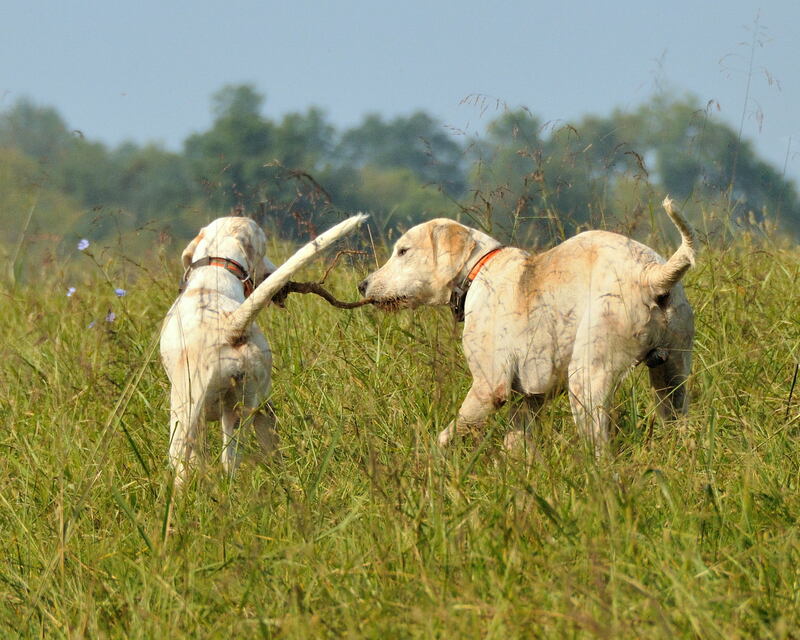 Some of the third- and fourth-season hounds have been there, done that, know it, want to go hunting and are great hunting, but they’re not as disciplined as I need them to be. It’s harder for them, because they’ve hunted before and they know the country. Some of the older hounds, like Baffle and Bonsai, they know we’re still on summer walk, and come hunt season they’ll change. When we start hunting, they’ll be out there pushing. But the aggressive males in the list I gave you, they’re just jealous and I lose their attention because they’re reactive to each other. 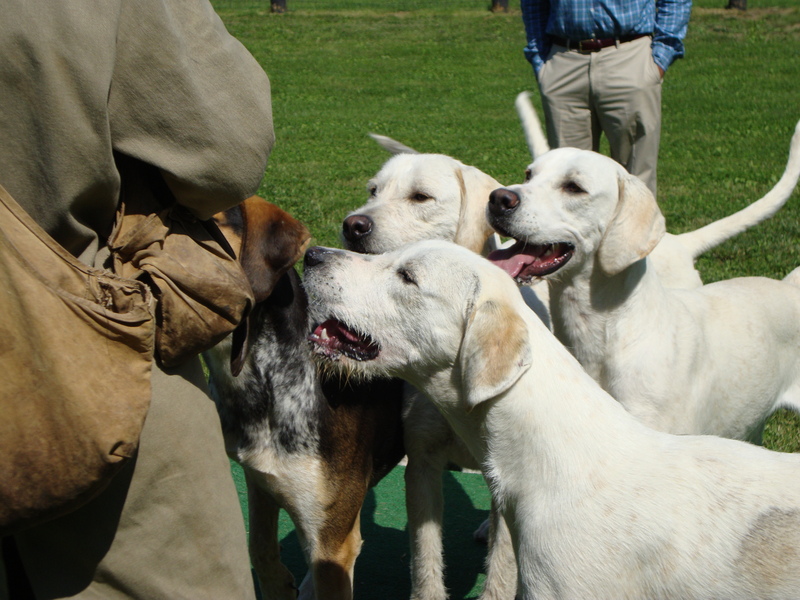 Hound jealousy, a competitiveness or personality conflict between certain hounds, can cause a practical problem for a huntsman. 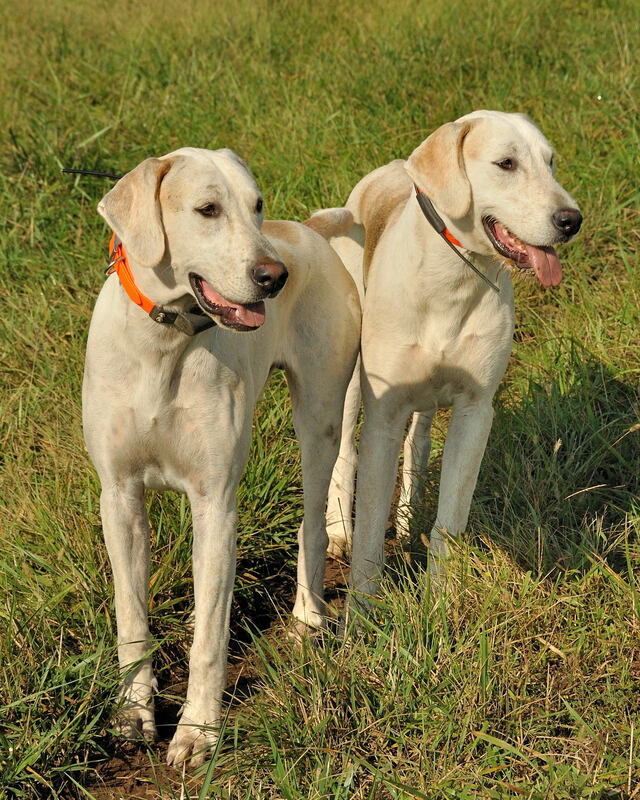 As hounds compete with one another to find a line, they can pick up speed and momentum, blowing through coverts too fast instead of working cooperatively with each other and their huntsman. Hunting can be very fast indeed when a pack is on a run after the speedy coyote, but to find that coyote’s (or fox’s) line, it takes careful, methodical work. And that means being slow enough to have a real sniff. 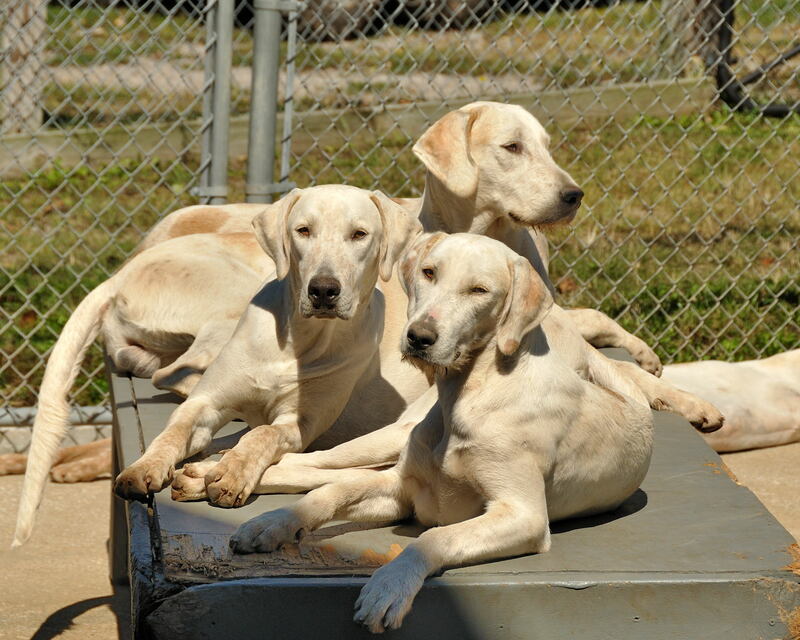 Some of the pack’s type-A males, like Gaelic (center) have had some issues to iron out on summer walk. 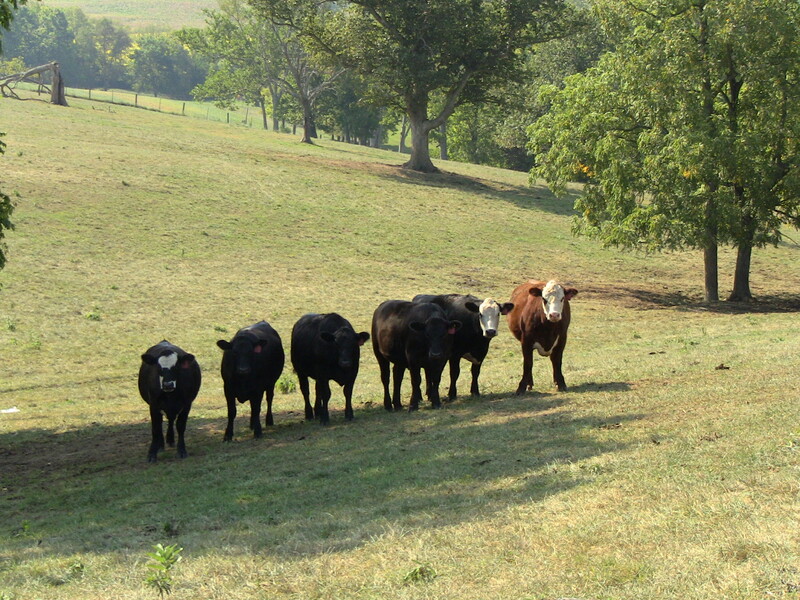 Boone Valley’s resident cattle have been curious onlookers on hound walk. 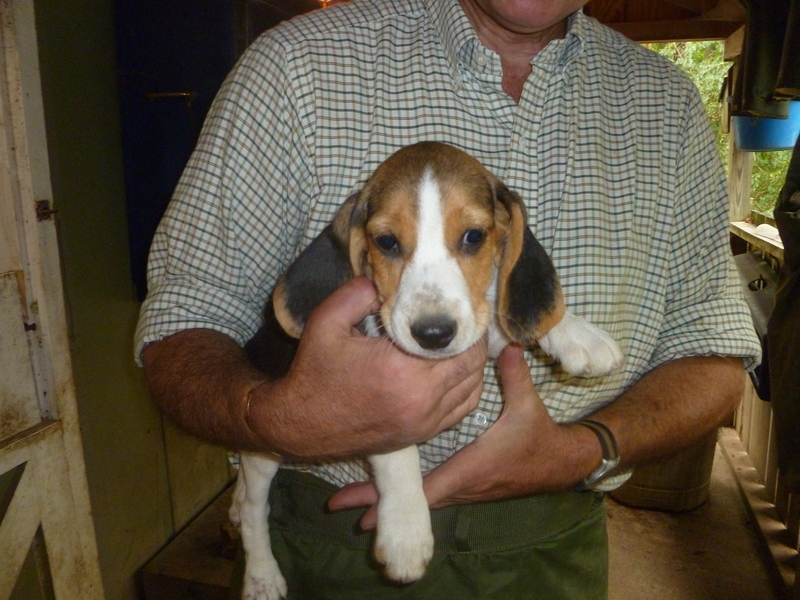 An interesting side note about one of the type-A males Lilla mentioned: Bailey, one of the highly successful BA litter (half-siblings to the HA litter who will be in their third season this year), was one of the first of his litter to “switch on” to hunting as a youngster in his first season back in 2010. He and Backfire were both on the muscle early, though Backfire has proven more attentive to the huntsman recently. Ironically, the best way to achieve that seamless pack is to work with hounds individually, which is why this summer Lilla has been taking out smaller, separate groups out on hound walks rather than lumping the whole pack together for a single walk. And she’s happy to work on smoothing out these personality conflicts in small groups now, because she finds the alternative–more aggressive whipping-in to a larger group–unappealing. 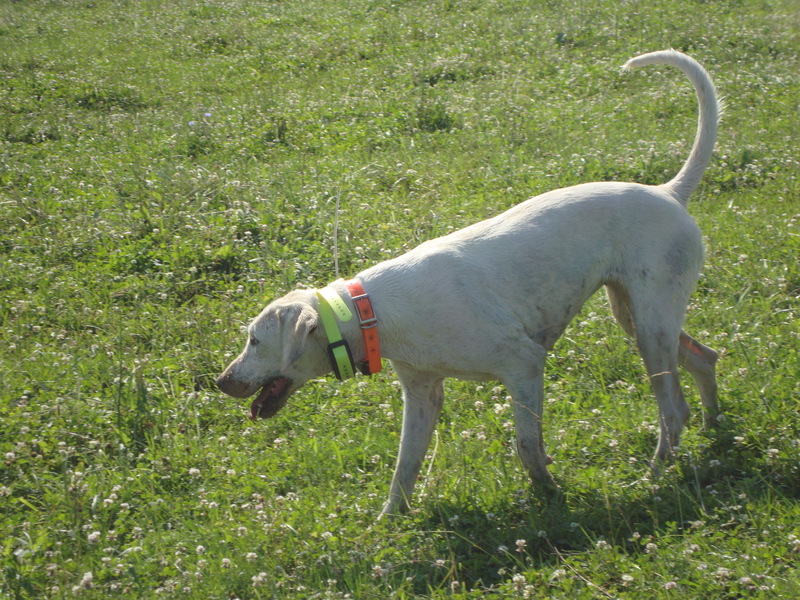 That can scatter game, and it also has the effect of punishing or putting pressure on the whole pack for the infractions of a few overly aggressive hounds. 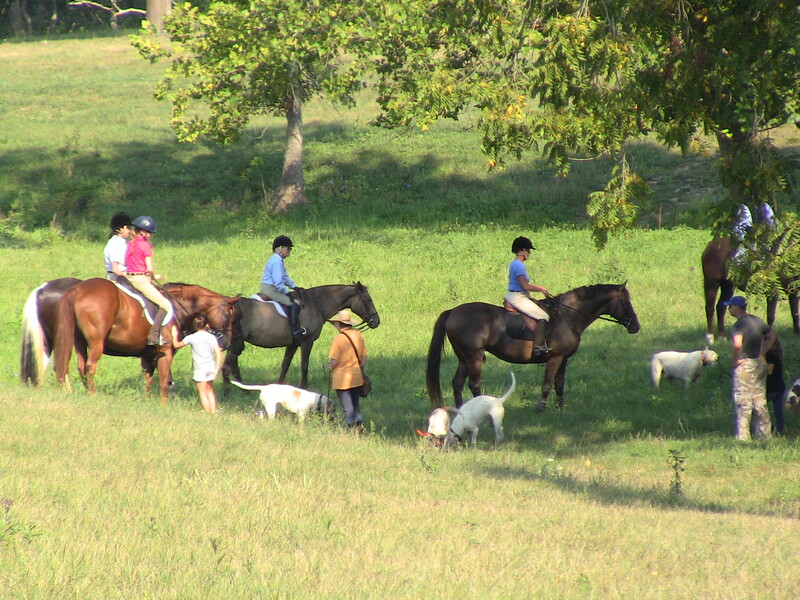 Betsy, Lucy, and Janie keep an eye on the hounds. The type-A hounds have responded well to their summer work. 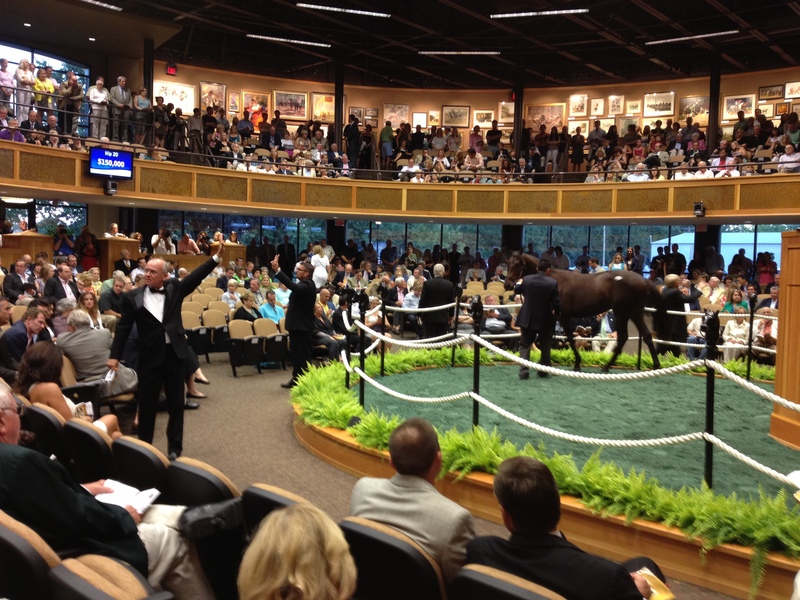 Instead of pulling too far ahead of Lilla or fanning out too far, they’ve been packing up well around her. A big test came on Saturday. 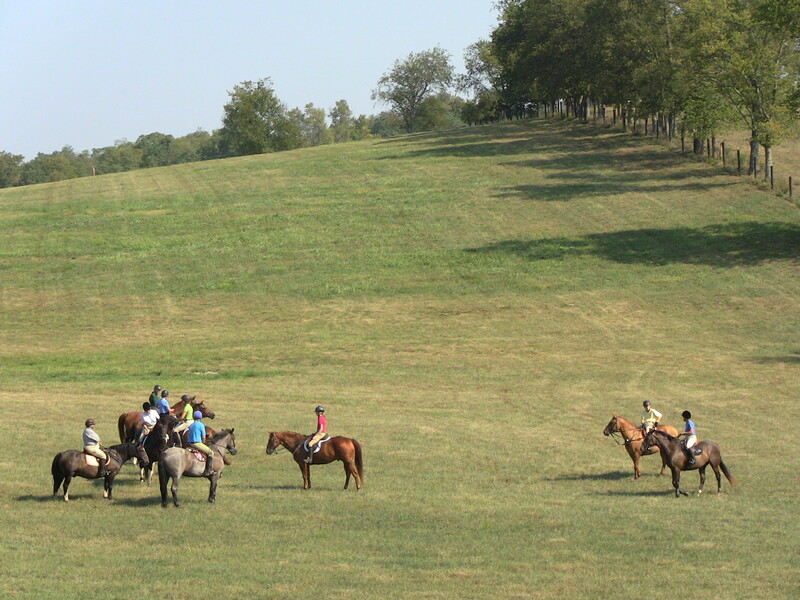 A squall line blew through the night before, leaving cooler, damp conditions on Saturday morning as the hounds poured out of their trailer at Boone Valley. In those improved scenting conditions, and even with coyote-rich Pauline’s Ridge as a backdrop, the type-As held together and showed a lot of discipline to resist whatever wafting scent might have tempted them away. 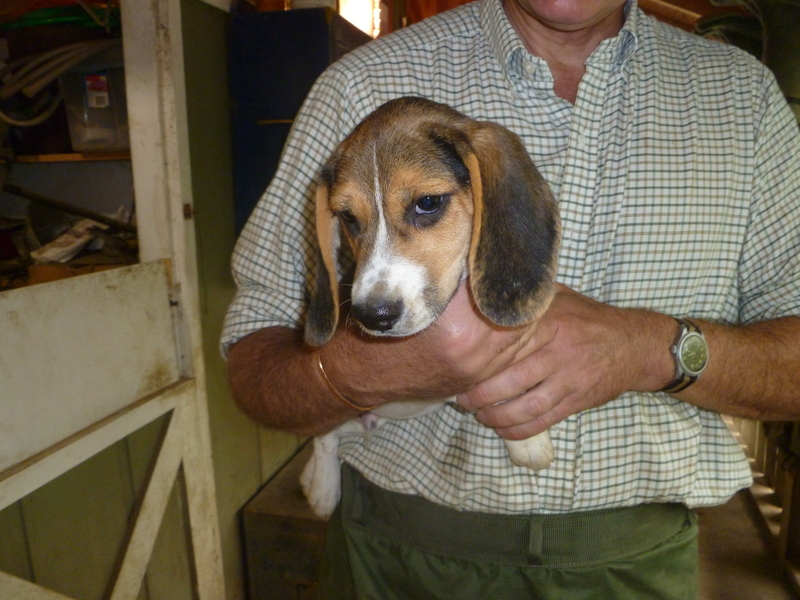 It’s not too long before we will ALL be tempted away from our daily cares to follow the hounds out hunting again! We hope you’ll stay tuned. 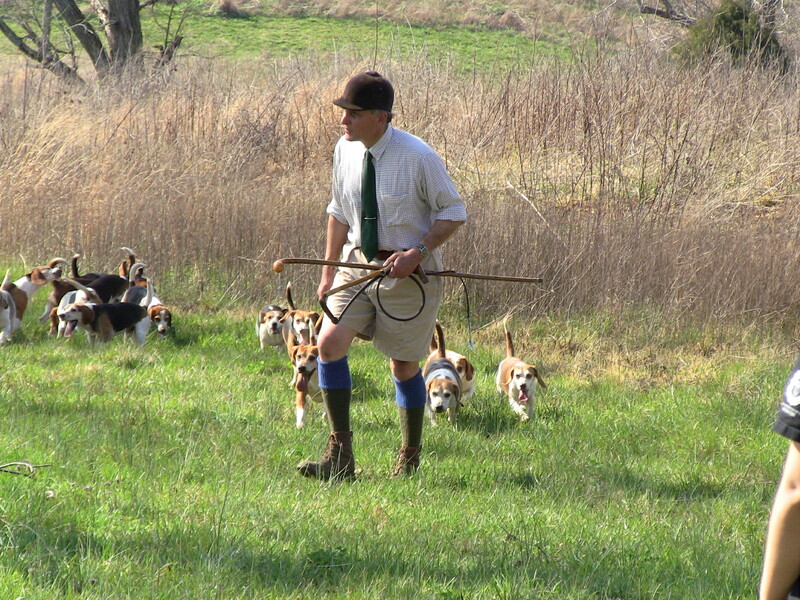 Clear Creek Beagles huntsman and joint-Master Buck Wiseman. 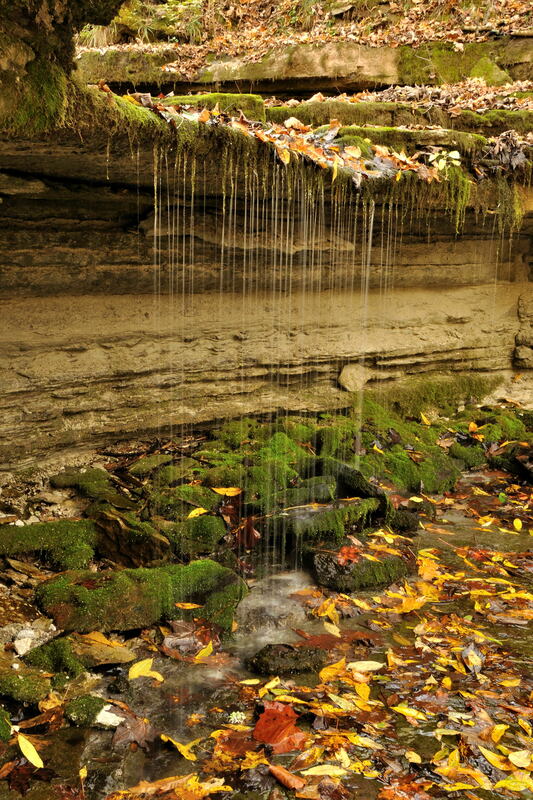 Photo by Brian Blostica. 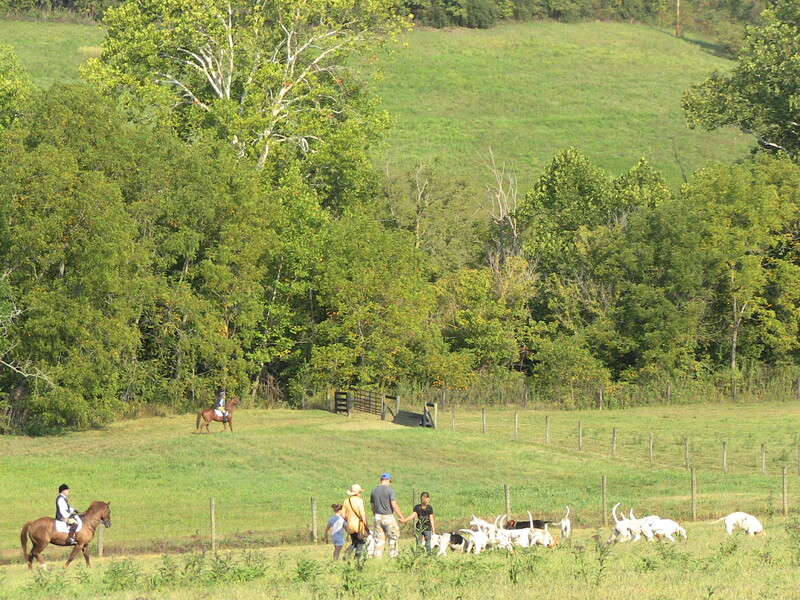 Recently, while writing a short description of foot packs at the Shaker Village at Pleasant Hill, Kentucky, I made the mistake of wandering off task and shedding some thoughts about pack cohesion and pack response, both to a huntsman and to one another. Mrs. Houndblogger picked up the line and reminded me that I had told her, well over a year ago, that I’d write something on the subject. She’s now run me to ground, I suppose. What follows may be a lot of nonsense, and, for the most part, it certainly isn’t science, but having hunted packs of hounds, foxhounds, beagles and bassets, mostly beagles, with a couple of short reprieves, since the mid-1960s, I do have views, and, right or wrong, I’ve never been overly restrained in expressing them, so here goes. "Biscuits, lots of biscuits!" 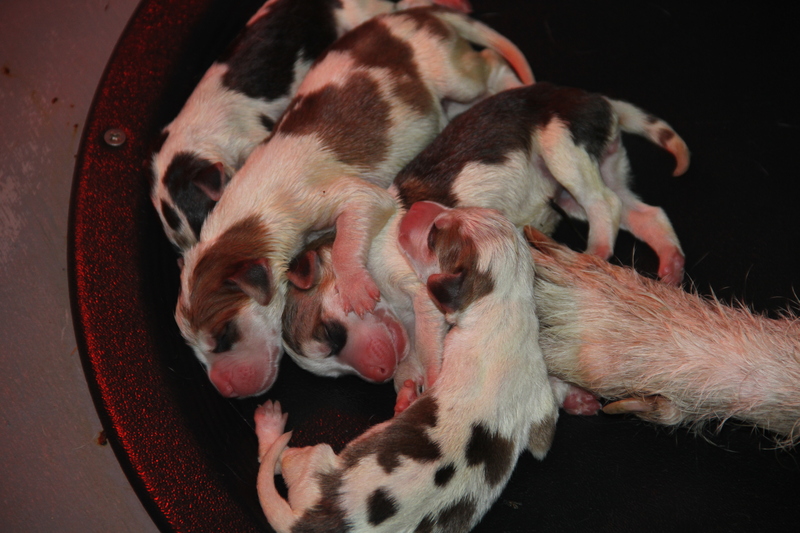 one early mentor advised Buck when he formed his first pack. Houndblogger photo. We have all seen huntsmen for whom hounds just “do.” They seem to have the touch, the right body language, to hit the right note of voice or just have a feel for hounds and seem to have always had it. 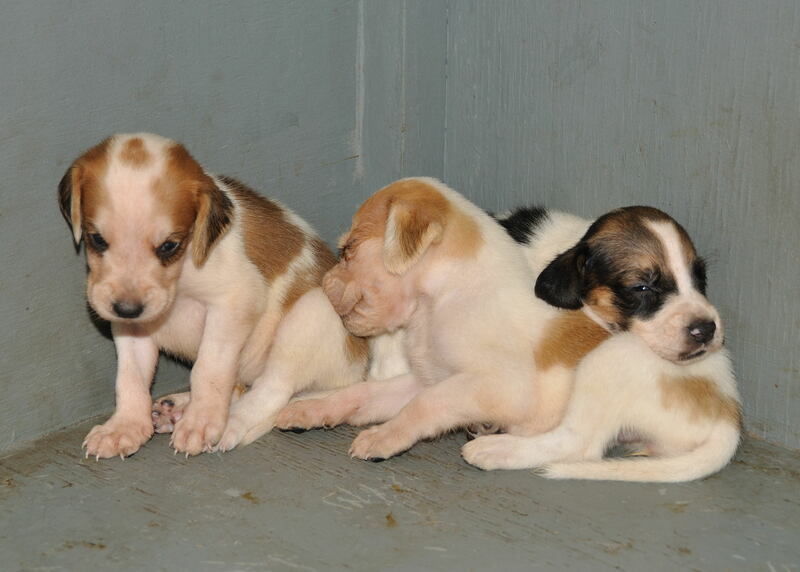 They can hunt a large pack of hounds without resort to a whipper-in, walk out the entire kennel likewise and pick up the horn with a strange pack almost without missing a beat. In many cases, I believe that they may not know exactly how they do what they do, may be puzzled that others cannot duplicate their results and may take years to really analyze what it is that they do. At this point, we’ll put that subject largely aside because the purpose here is to look at intentional and conscious acts with the goal of approaching, if not equaling, the results that those huntsmen achieve. The right personality in the pack helps. A good huntsman can get response from a gaggle of thick-headed independent types, but we all know that some hounds are more responsive to a huntsman and to one another than others. I believe that the two are clearly linked. 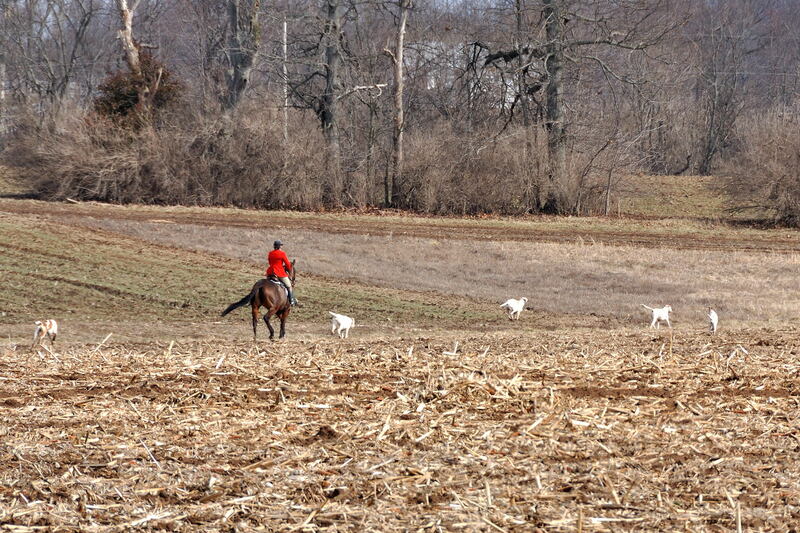 As an example, if hounds need to be moved from one spot to another across a field or within sight or sound of the huntsman, the entire pack need not see or hear the huntsman. 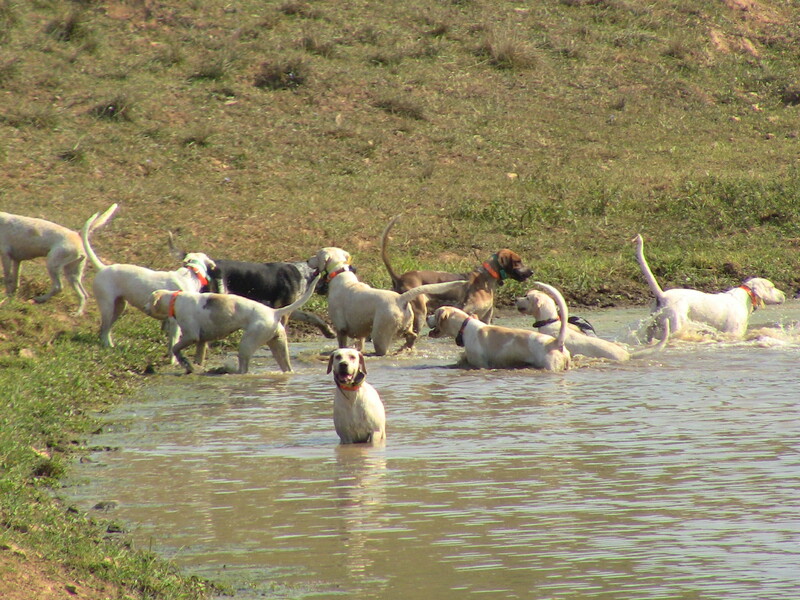 If the pack is responsive both to the huntsman and to one another, it’s only necessary to catch the attention of the hounds nearest you as you call and point to where you want them, the other hounds will respond to the first who have responded to you and stream over. 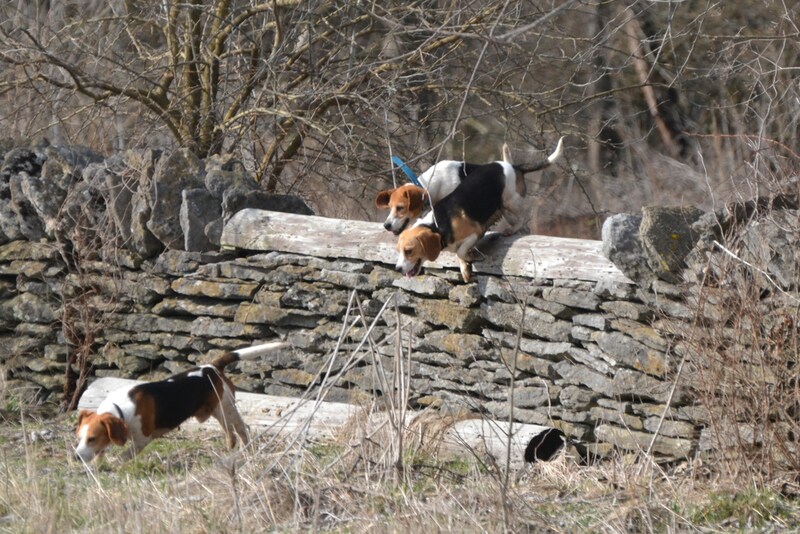 Buck and the beagles at Shaker Village in March. Houndblogger photo. I make a concentrated effort to address each young hound, every hound for that matter, frequently by name and to toss a biscuit to catch. Each must not only learn his name, but also learn that response to your voice and to your hand brings good things. Only when a hound has learned those things should you touch them with the whip and chastise them. Each has to understand that the discipline is the result of ignoring someone who otherwise dispenses blessings. It’s also at this point that the pack sense is important. 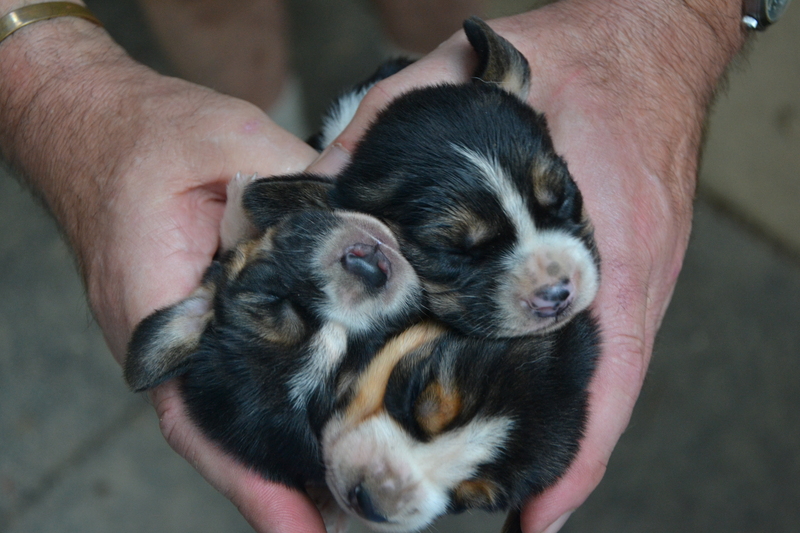 If, say, two couple of puppies start up the road bank on their own little mission, if you can, with an encouraging voice, swing one couple to you, with the right sort, the other will turn right with them. Have the biscuits ready when they reach you. 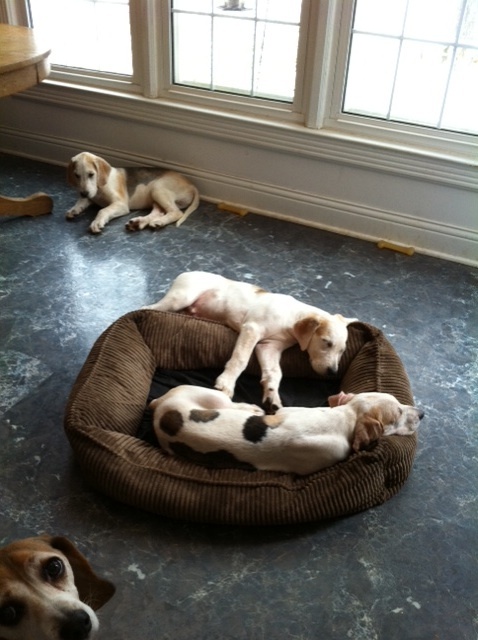 Lilla Mason (and the biscuit bag) with some of the Iroquois hounds. Houndblogger photo. If you have the luxury of assistance in walking out and of whippers-in in number when you hunt, teach yourself not to rely on them. A whipper-in should be viewed by a huntsman as the last, not the first or even the intermediate resort. If hounds are always or even frequently put to you by your whippers-in, then, in some measure, their return to you is a response to the threat of the whipper-in, not to their rapport with you. It is better to have the sometimes slightly slower response deriving from rapport with the huntsman than the faster coerced response. In fact, when walking out with whippers-in, discourage them from being more than a reminder of the possibility of reproach unless that whipper-in is pretty well endowed with hound sense or knows the hounds very well. Whippers-in tend to want to be helpful and, if overly so, are not helpful at all. This is especially true if you have puppies out. Develop rapport and trust it. Whippers-in should do likewise. When hunting, I do not want my whippers-in even near me. Ideally, they should be eyes and ears, your distant early warning and spotting system. The title “whipper-in” should relate to their function only in difficult circumstances. The goal is that rapport will fill the gap. Studies in animal behavior and language have shown that certain types of sounds have similar effects across a wide range of mammals. Without going into a great deal of detail, suffice it to say that higher-toned, excitable sounds encourage, soft tones soothe, growls caution or chastise. It works for hounds and humans. Your voice must change constantly to match your message. Cheer them on, cheer them in, growl and crisply bark warnings. Again eye contact and body language is also critical. Many times, when getting the attention of a particular hound to return into the pack while walking out, I will not only call the hound’s name, but once he looks at me, point directly and growl “Yes, you” or “You know your name.” Recent scientific work has, in fact, shown that the dog is one of the few non-primate species which will follow the point of a human hand. They do. If you can get eye-to-eye contact, you’ve got him, at least as long as you are the dominant personality in the pack, not the hound. If you are not, go for a softer sort. Modulate your voice at all times in tune with the circumstances. When walking out, a conversational voice is probably just right. Talk to your hounds. If you are drawing cover, suit your voice to the way the hounds are drawing. If they are quite close, not much above conversation is necessary. If hounds are drawing widely, as mine typically do, the volume must increase. The goal is that all of your hounds can always hear you when drawing because you must be at the center of that process, if you are going to direct it. 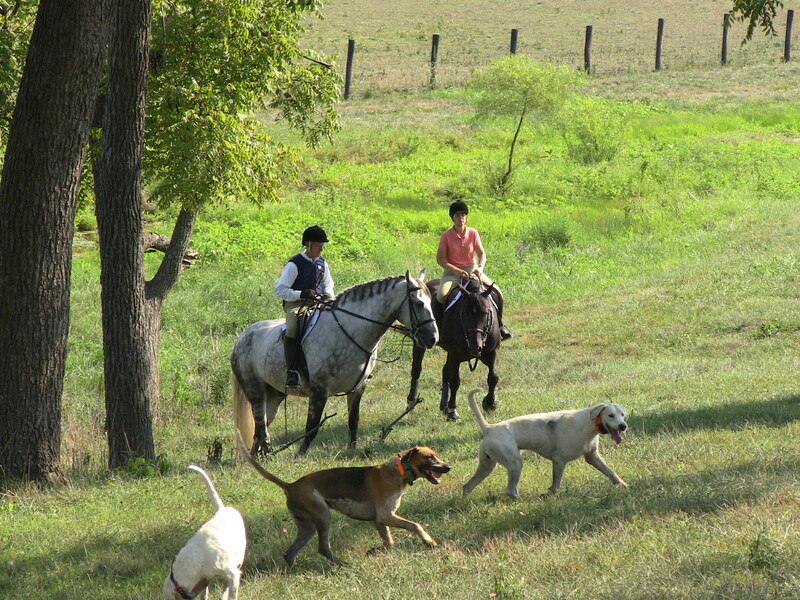 Huntsman Lilla Mason with the Iroquois hounds on summer walk. 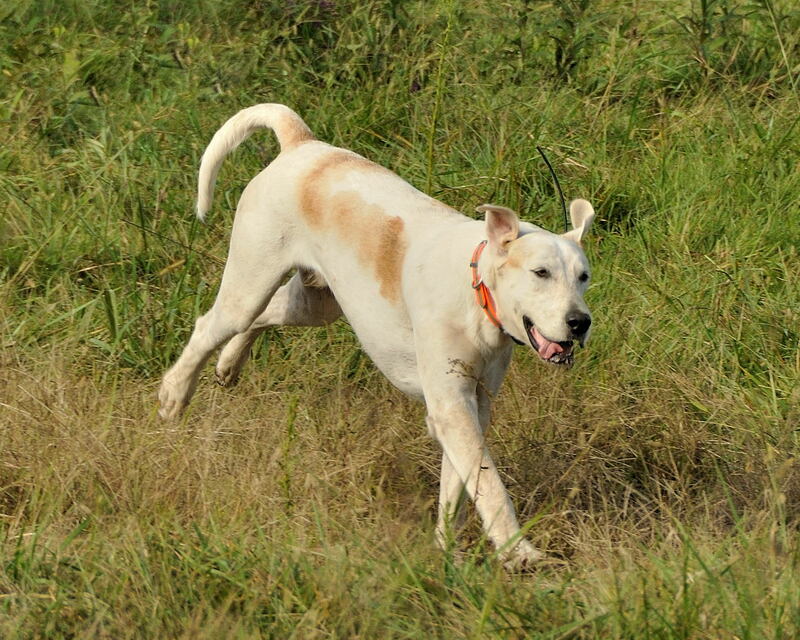 When calling hounds in from a distance, don’t yell for them. Instead, go for a deep in the chest, rolling tone of encouragement. They will respond. It’s not unlike the signaling howl of a coyote or hounds singing in kennel. Hounds being put on to a line, once they have reached the huntsman, should be put on quietly with low encouraging sounds and with the arm, hand and body motion directing them in the direction that they should go. Rapport is bi-directional. 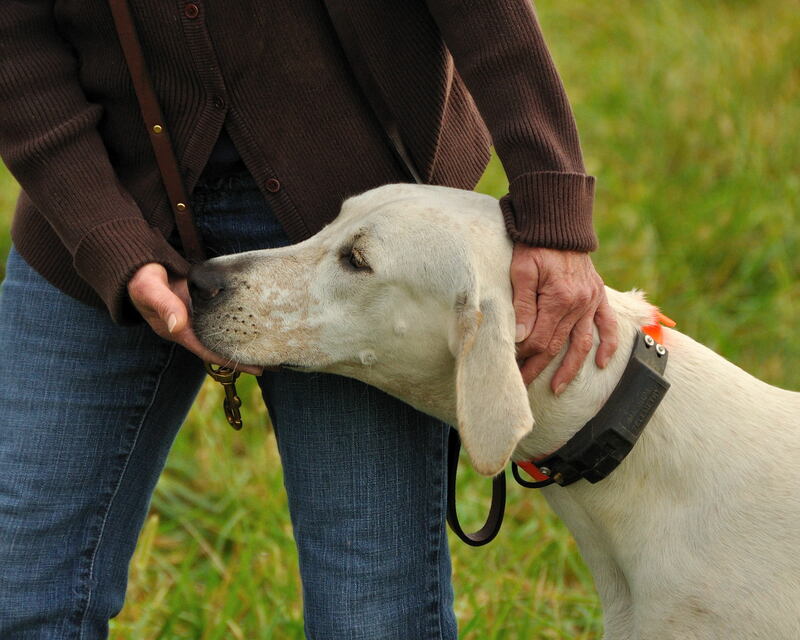 Watch every hound for the body language and focus that tells you when they are “with” you. 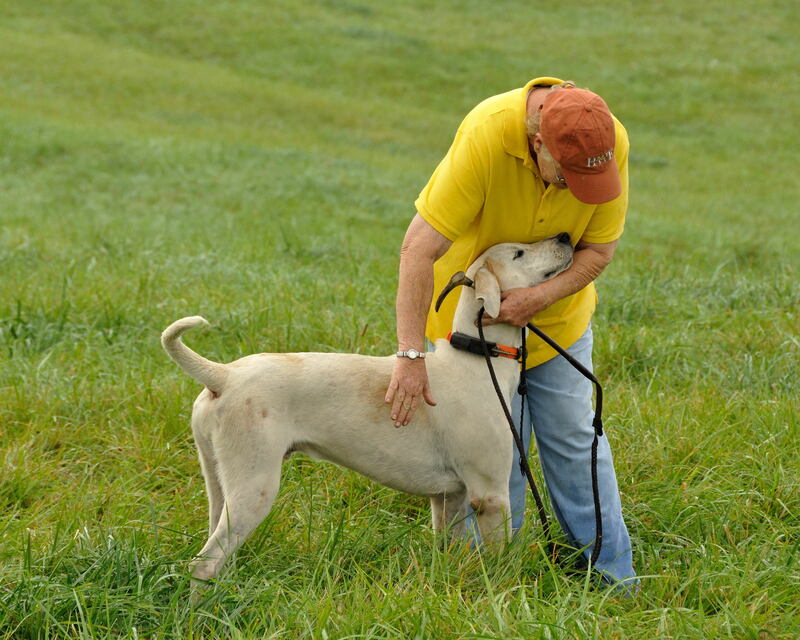 Also watch hounds for the signals, sometimes very subtle signals, that hounds can give you–and trust them if they do. 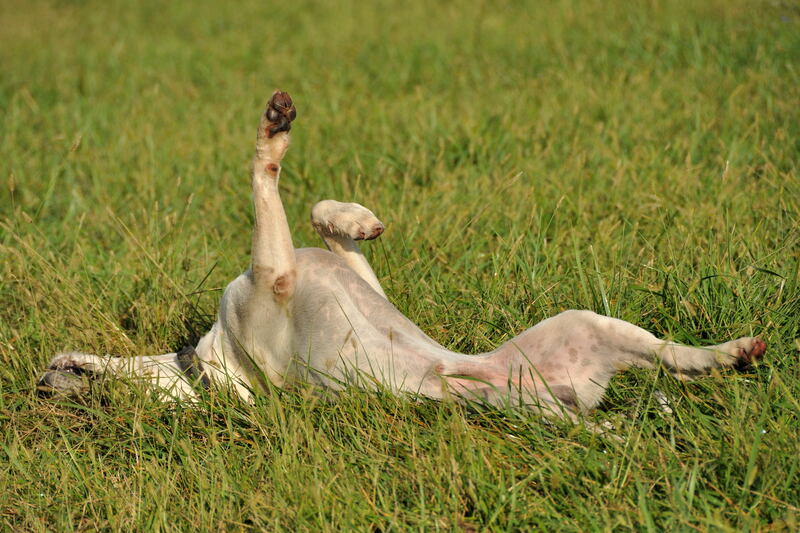 Hounds may appear to be simply drifting from a check. The temptation is to pull them back, but if watched closely, slight body signals may indicate that, while they are not speaking or even visibly feathering, they are focused on some slight scent, perhaps even air scent on a bad scenting day, to which they are drawn and which may result in a recovery. Even if those hounds fall in with the movement of the pack and return, if the line is not recovered, go back to where they went, if it is the only message that the hounds have sent you, and a more diligent cast in that direction may work. It has before. 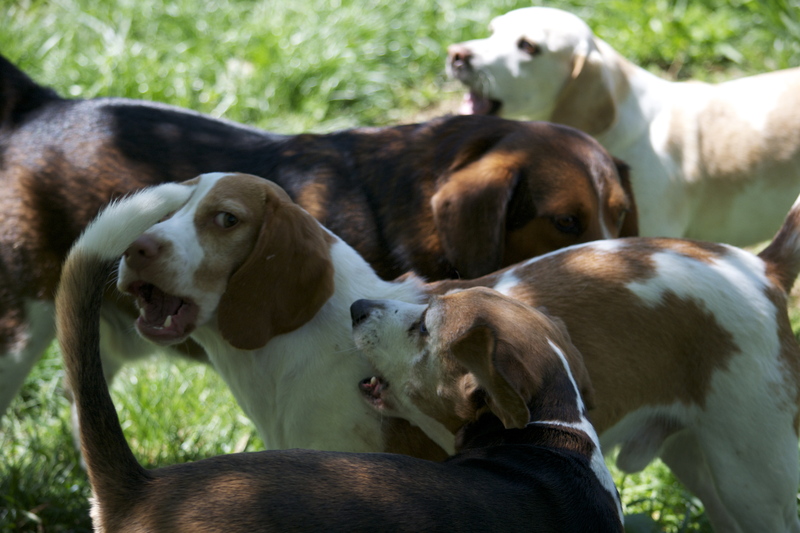 In the houndbloggers' experience, some hounds are beyond controlling, even if you have a rapport with them! 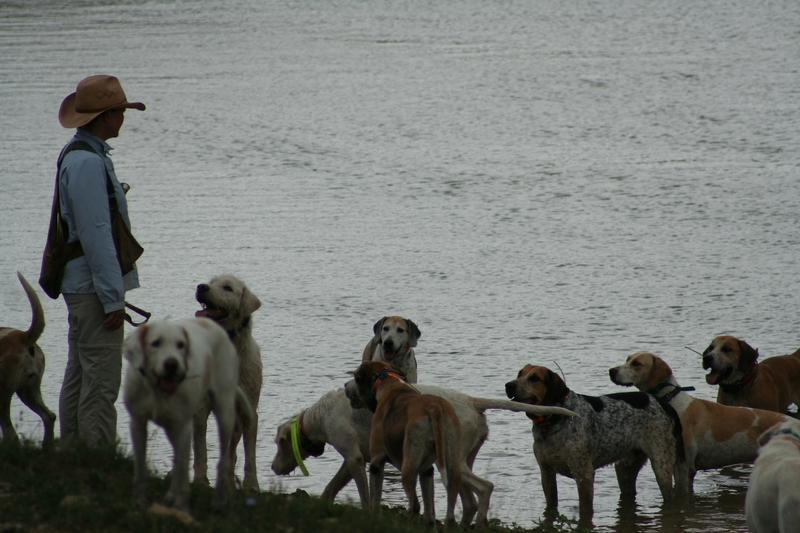 Houndblogger photo. With that thought, I’m going to leave rapport because, in a real sense, I already have and drifted, like hounds losing the check, on to the role of dominance in working with hounds which is a subject better left to another day. Many thanks to Buck for contributing this great piece! 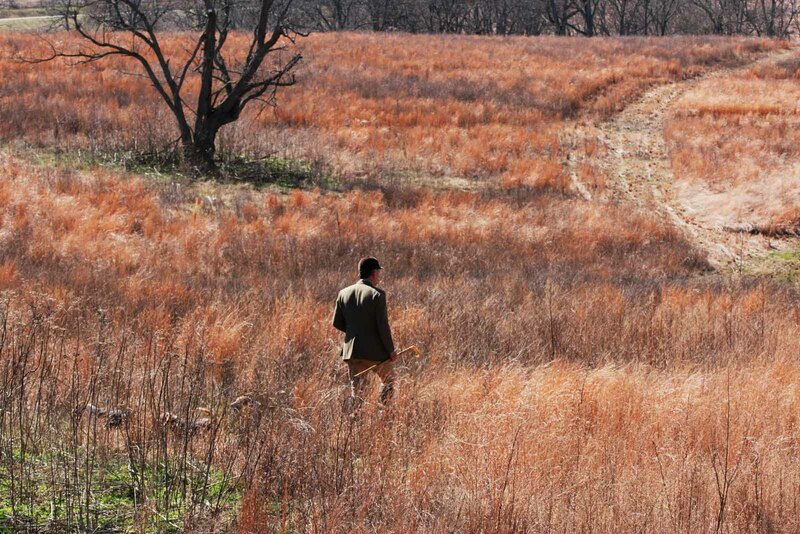 If you’d like to read more from Buck, please click here to read his earlier piece on hunting over game-rich restored native grasslands. THE houndbloggers are fond of Great Britain’s Horse & Country TV network (you can find a link to it in our “Interesting Places” category on the right-hand side of this page). Recently, they featured a documentary there called “Hounds and the Huntsman,” by filmmaker Michael Slowe. It’s both beautiful and informative and provides an interesting glimpse behind the scenes at a traditional English hunt, the Chiddingfold, Leconfield, and Cowdray. To see this excellent video, click here. 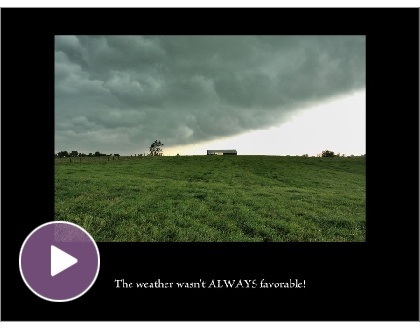 A brief ad plays before the video, and there are several very short breaks between segments; the entire video runs for 48 minutes, and it’s well worth a view. The adventures of a fawn that joins the pack on a walk, the ingredients of a drag line’s distinctive odor, and a formal meet at Petworth Park are all worth the wait! Those of you who are familiar with the Iroquois Hunt will note several differences in how huntsman Sage Thompson manages and trains his pack, including the use of couples and feeding flesh, but you’ll undoubtedly find some of the relationship-building between huntsman and hounds to be very similar. And it seems hounds speak “biscuit” fluently the world over (and, yes, there are a few woollies in the Chiddingfold, Leconfield, and Cowdray pack)! 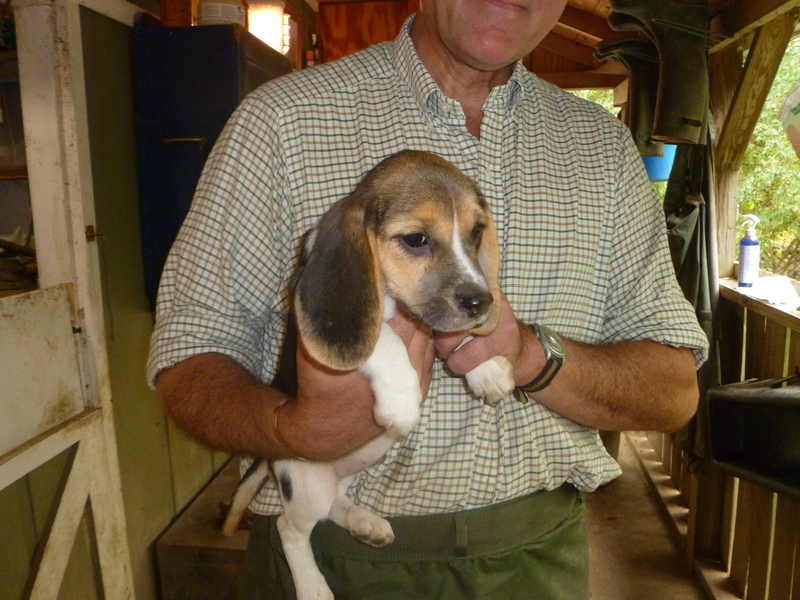 The most striking difference, from our point of view, is about breeding and hound retirement. 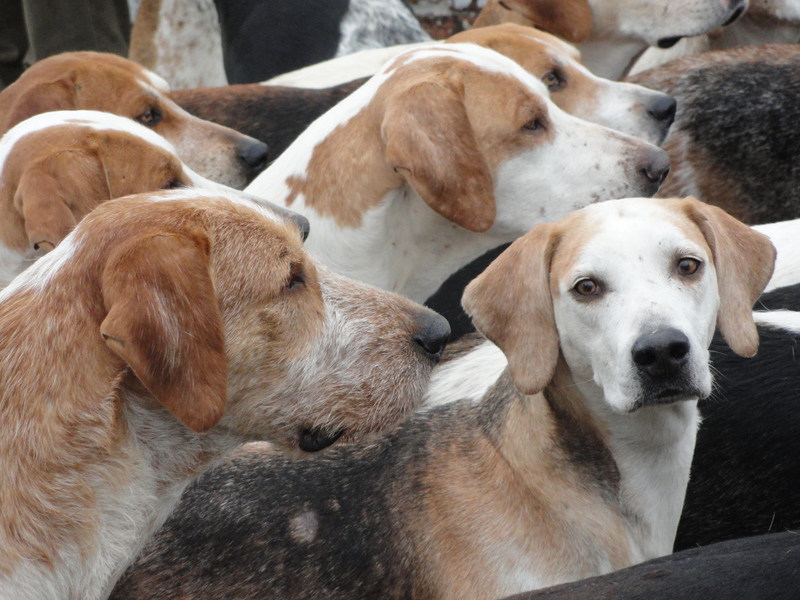 The Iroquois Hunt generally breeds only a single litter a year and retires all of its hounds–even those that never make it into the working pack–to live out their days in dignity under the auspices of the 501 (c)(3) charity, the Hound Welfare Fund. 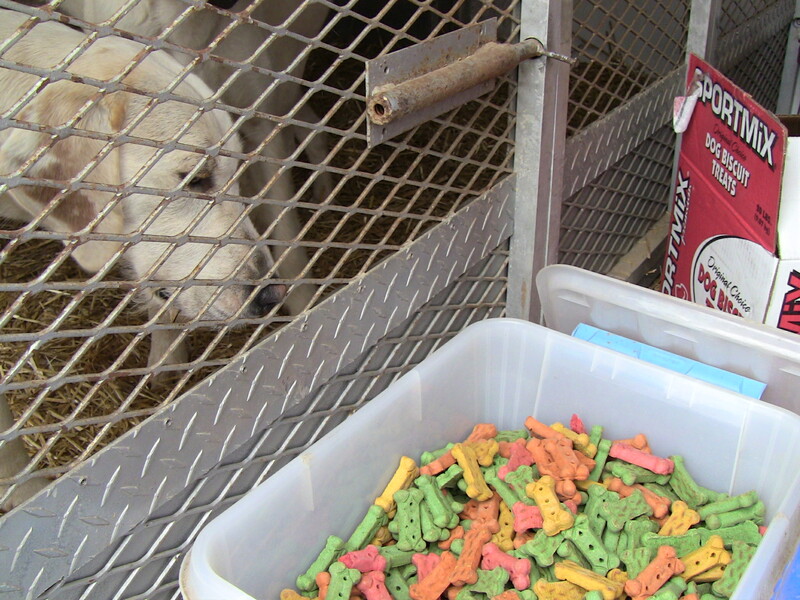 We don’t euthanize them until their time has come, and, when it does, they are put to sleep at our local veterinary clinic, surrounded by the people who have cared for them all their lives. During their retirements, they serve as both treasured friends and admired ambassadors for the hunt–and we have yet to see them sulking! 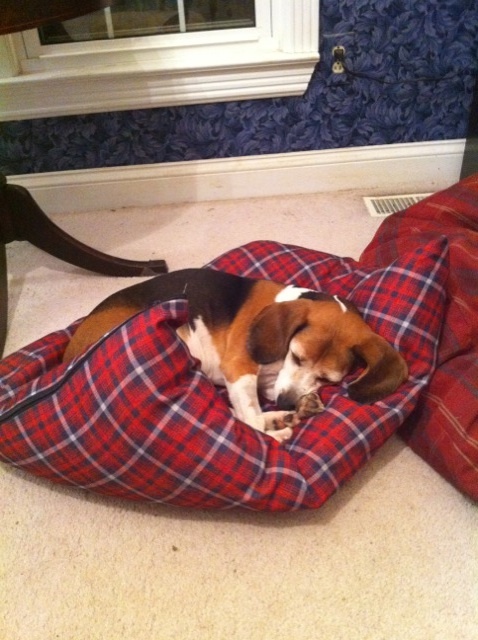 The retired hounds we know that have gone on to live in houses–including the houndbloggers’ own former pack-hunting beagles, Mr. Box and Eider–also have adjusted very well. 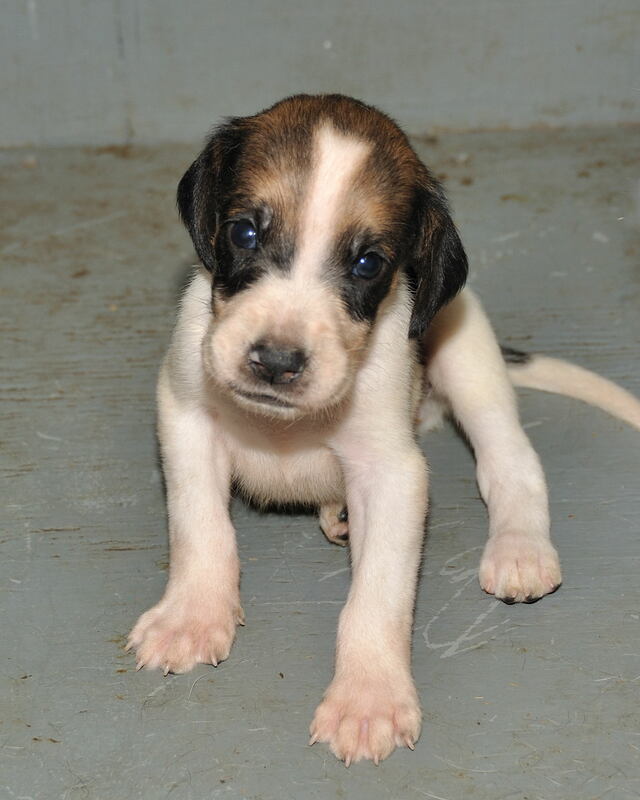 And speaking of the retired hounds … we’re busy preparing for this year’s Hound Welfare Fund benefit auction, which will take place on June 4. 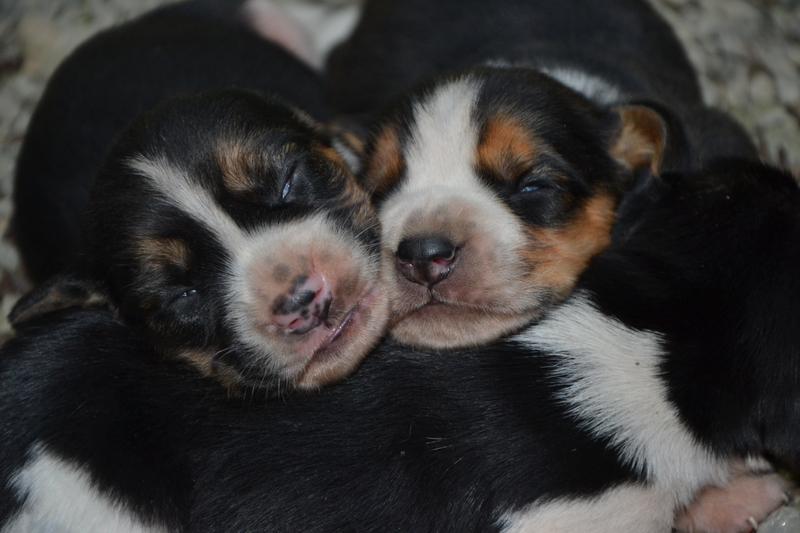 In the meantime, won’t you consider making a tax-deductible donation to support the retirees? “There have been sufficient rains to lay the summer dust, and there is a slight yielding on the surface of the turf, as a horse canters along. A goodly shower the previous day has left the grass still moist, and there is a delicious coolness in the air. It is barely daylight when you ride up, and after posting your men at different corners, you throw hounds into covert. … The place you are about to draw is ten acres of blackthorn and gorse in the middle of your best country. “Though you will probably have no use for a second horse, let them come out, and the men may be of use to you in assisting the whips. Another hint: before you leave home, make a good breakfast, however early the hour, or you will probably be tired before your fox. “You are drawing downwind, so that there shoud be no danger of chopping an old fox, and, riding into the thickest part, you encourage the young hounds to try. Old one-eyed Solomon from the York and Ainsty is busily snuffling at a tuft of grass, probably where a fox stopped a minute on his way to his kennel. The little tan dog from Belvoir forces his way through the narrow smeuse, and then makes a dash at the clump of briers that are interwoven with long grasses. There is a flash of bright red fur, and a white tag disappears in the thicket beyond. 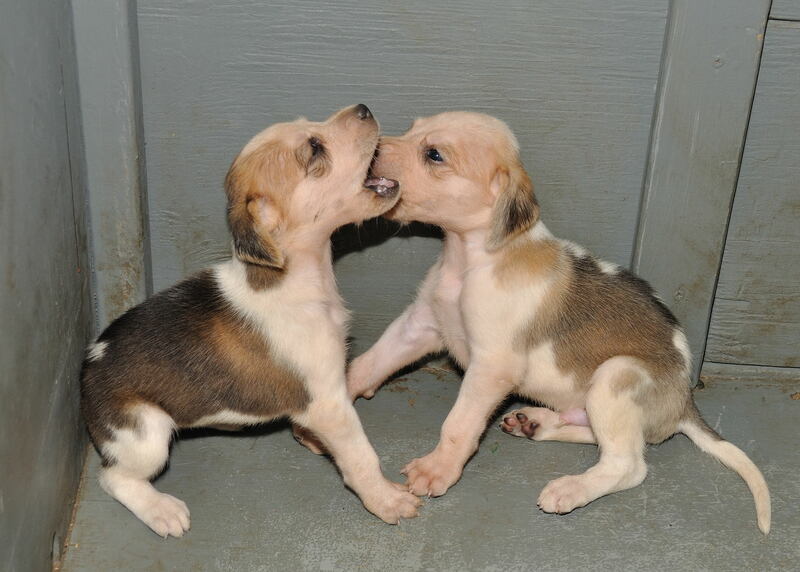 A cheer from your lips and a blast on th ehorn brings all the old hounds to the spot. “The melody soon increases in volume, and in a few minutes every hound seems to be throwing his tongue. Some of the young ones have already joined in, and the rest are following on with the excitement of the cry. Keep quiet now, and don’t holloa if you see the fox, whilst they are running well. Listen! there are two or three scents, the tail hounds have crossed the lines of other foxes, but the majority of the old hounds still stick to their first-love, and are bustling him round the covert with an echoing crash of music. It must be a dog-fox, and he will very soon have to leave, but at present he thinks the pack are too near to make it safe. There is a sudden lull–now he is away, and you hear the hoof-beats of the whip’s horse as he gallops down ready to stop hounds should they come out. Your orders were to stop hounds and let all foxes go. Bonus points if you know what a smeuse is without having to look it up! And, no, we still haven’t changed the wallpaper below that chair rail, have we?